It’s easy to get carried away with your daily routine and also easy to put learning on the backburner. 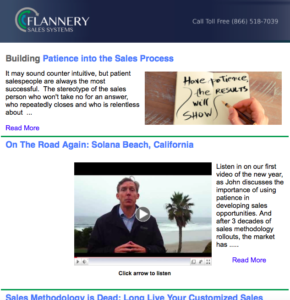 With our monthly blog, we help you actively stay up-to-date on trends and topics, making sure you’re always gathering fresh ideas and stay in-the-know to sales processes. Sign-up for our monthly newsletter to receive sales tips from experts at Flannery Sales Systems. You can check out current and past blogs here!